Will Stevens: Who is Formula 1's new English driver? 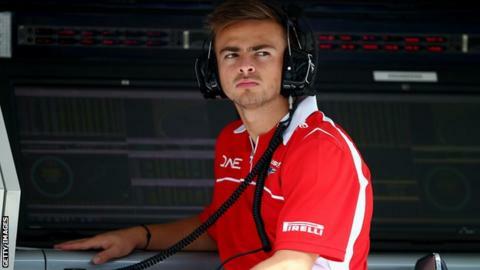 Will Stevens was named as one of two drivers for the Manor team in the 2015 Formula 1 season. Every Formula 1 driver has to start somewhere and often that's closer to the rear of the field than the front. For Will Stevens, it couldn't be further back. The 23-year-old from Essex is in his debut season in F1 with the struggling Manor team, revived at the 11th hour ahead of the 2015 season from the ashes of Marussia, who collapsed three races before the end of last year. It is hard to think of a more difficult place to try to learn your craft at the pinnacle of motorsport. Manor, still run by team boss John Booth and president Graeme Lowdon but now funded by investment from Stephen Fitzpatrick of energy firm Ovo, made it to the first race in Australia only by the skin of their teeth, but were so ill-prepared than they could not even get their cars out of the garage in Melbourne. Two weeks later in Malaysia, the team could run only one car at a time, and in qualifying that turned out to be that of Stevens' Spanish team-mate Roberto Mehri, who was five seconds slower than the next slowest car. In China last weekend, Stevens finally managed to do what he is there for and take part in the race. There was progress. Both cars finished the grand prix, and this time the fastest Manor - Stevens - was less than three seconds behind the McLaren-Hondas in qualifying. But given that Stevens, like many young drivers, has to pay for his drive, people may wonder why he would choose to spend his backers' money to be so far off the pace. But he insists he is doing the right thing, saying he has confidence the team is going in the right direction. Stevens, who was briefly Marussia's reserve driver last year before their collapse, says: "Because I had a relationship with the team from last year, we kept in close contact throughout the winter and we wouldn't have entered into it if there wasn't certainty there. "From our side of it, we are very happy to be here. We can see where the team want to progress to and I want to be part of that journey." Stevens is less certain about where exactly he sees the team going, saying merely that it is "hard to tell" what Manor can achieve. But few men are as steeped in motor racing as Booth and under his guidance Manor won everything in a long career in the junior categories. Manor might be battling against the odds with a tiny budget in F1 terms, but this is a team with a strong racing pedigree. Cynics might argue that the same cannot be said of their new English F1 driver. Because he has paid his way into F1, Stevens has inevitably been dismissed by some as a 'pay-driver', a disparaging term for someone who has bought his way in because he does not have the talent to earn a place on merit. Is the criticism valid? Stevens says no. "There are lots of drivers up and down the pit lane who are in the same position," he says. "The sport is completely different now. There are huge companies who want to get into F1 because it is a global market. "We are bringing sponsors with us who want to invest into F1 and expand their brand into the sport. It is a great market to be in because of the publicity it has throughout the world. "It is very attractive for sponsors and I am in the great position that I have sponsors who want to do that. People like Felipe Nasr and so on are in exactly the same position." The example of Nasr is a pertinent one. The Brazilian's seat at Sauber was funded by backing almost certainly several millions more than whatever amount Stevens is paying to Manor, and Nasr has made a very strong impression in his three races so far. Stevens is in a more difficult position. In a team at the back of the grid by some distance, his only comparison is with his team-mate, who is also unproven. All he can do is beat Mehri, which he did comprehensively in China. Stevens also showed well against Kamui Kobayashi on his one-off F1 debut for now-defunct Caterham at the end of last season. It was hardly the ideal circumstances in which to have a first experience of racing in F1. After collapsing at the same time as Marussia, Caterham had been revived for a single event in the vain hope of finding a backer, and Stevens - who paid £500,000 to drive that one race - was up against an experienced F1 driver who had been in the car all year. To qualify half a second off the Japanese was a good effort in the circumstances. Stevens says that performance gave him the confidence to believe he was good enough at least to have a go at F1. "Massively," he says. "The main thing was not to make any stupid mistakes and build my way in slowly. "It was disappointing to miss first practice because that set me back quite a lot for the first couple of sessions but I knew when I arrived in qually I'd there or thereabouts, which I was. "I made a small mistake on my lap, otherwise I'd have been right on Kamui's pace. "The positive for me was that I always wanted to start with an experienced team-mate. Kamui's very well respected up and down the pit lane and it shows that against guys like him I can do a good job." Stevens's junior record also suggests he deserves a chance to show what he can do. His performances in the junior formulae did not attract the support of a major organisation or senior figure, as did those, for example, of Fernando Alonso, Lewis Hamilton and Sebastian Vettel in their younger days. And he did have to source his own backing to get into F1. But to dismiss him as someone without sufficient talent or somehow unworthy would be unfair, given the evidence. He had a solid junior career and in 2013 he finished fourth in a very strong field in the highly rated Formula Renault 3.5 series. The three drivers above him were Kevin Magnussen, who raced for McLaren in F1 last year and is now their reserve driver, Stoffel Vandoorne, another McLaren protege, and Antonio Felix da Costa, the Red Bull test driver. Carlos Sainz Jr, the Red Bull driver who has made his F1 debut with Toro Rosso this season, was also racing that season. Against strong competition, Stevens won two races and took four podium finishes. It will be some time - at best - before Stevens or Manor can hope for the same in F1. For both the team and Stevens, the start of this season is about making solid progress, doing the best they can with the modified 2014 car with which they have started the year and hoping for better when they introduce the definitive 2015 car, with the much more powerful new Ferrari engine, some time in the summer. "At the moment we are taking everything easy," Stevens says. "I have time on my side. It is an exciting time for me and I am looking forward to getting going. "I feel confident that I can do a good job for the team and I can do a good job for myself as well."